One thing we can do in Modern Britain is go to the pictures and watch Creation, the new Charles Darwin biopic, an experience allegedly denied to American audiences by distributors running scared from the religious right. As for me, I find the theory of evolution to be not only a good framework for understanding biological origins, but also a stimulus to excellent creative theology, from that of Frederick Temple (Archishop of Canterbury from 1896-1902) to Teilhard de Chardin (1881-1955), both of whom took it as a primary theological inspiration. Me Evolutionist. Thus Lucy and I joined nine others in a High Wycombe cinema (Low numbers, given that it’s 2-4-1 night Tuesdays) for last night’s showing of Creation. I went with high hopes, having enjoyed Adrian Desmond and James Moore’s wonderful Darwin biography last year. John Collee is a script writer whose work I particularly enjoy, ever since his terrific Paper Mask back in the eighties. So far, so good. This is lavish BBC style costume drama, spiced by some wacky psychadelic bouts of gastroenteritis, with abundant flashes backwards and forwards. Poor old Darwin’s tummy necessitated a lot of crazy lurching around like clubbers do on Saturday nights, with some hallucinations on the side — exploding slugs, stuffed birds flying, pickled babies winking, that sort of thing. Pretty standard stuff, really. 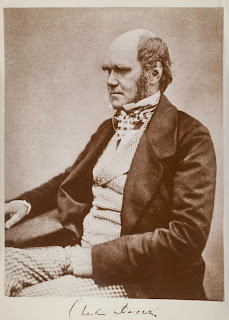 Charles Darwin was a decent family man, a sensitive Whig Squire, who studied nature, was very upset when his daughter died, and wrote a clever book. The visuals and design were sometimes gorgeous, and characters likeable enough, especially Jenny the Orangutan. Mrs Darwin managed to teach herself how to play the Piano to Paderewsky standard whilst waiting for something interesting to happen. That’s the story and I’m afraid it ain’t no King Lear. Unless that is, as some have suggested about Richard Dawkins’ TV series on the joy of atheism, the whole thing was actually got up by the religious right to discredit Darwin and all his works. Perish the thought. Two stars out of five. I think Darwin was probably a Whig/Liberal not a Tory. His uncle/father-in-law had been a Whig MP for Staffordshire in the 1830s. Also I believe the movie has now found an American distributor. The Damaris/Icon tie in means that there are good resources available for faith groups wishing to discuss the content of this film. I am biased because I wrote some of them but look at www.damaris.org for details. Erp, you are precisely right. I'm so sorry to have been carried away by a cliché into an entirely inaccurate phrase to use of an impeccable Whig reformer like CD: member of the Babbage circle, the lot. What was I thinking? Must try harder. Thanks very much for the correction. PS I am really sorry to have failed to mention one of the reason for this films visual impressiveness is its generous use of Bucks locations, including a starring role for Little Missenden Church, just down the road.